You can’t make an omelet without breaking a few eggs. But what do you do with the shells? In Caudell Hall, the shells—along with other food waste from the culinary labs used by Hospitality and Tourism students—will be processed and converted to a dry, soil-like mixture that can be used in Buffalo State’s gardens and arboretum. “I went to the National Restaurant Association show in Chicago when we were planning the renovations to Caudell,” said Stephen Burgeson, clinical lecturer in the Hospitality and Tourism Department, “and I was impressed by the equipment to process food waste.” Burgeson is a certified chef in the American Culinary Federation. He can be found teaching students who work in the kitchen of Campus House during the spring and fall semesters. However, students take the Campus House practicum only after they have learned their chops in two state-of-the-art food labs in Caudell Hall. When Caudell Hall underwent a $21.2 million renovation, the new labs included one especially for baking; the other is for preparing other foods. Ancillary rooms include spaces for salad preparation, with temperature controls that allow fresh green salads to remain crisp and appetizing for hours. 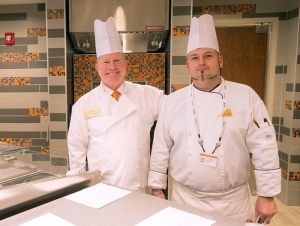 Pictured: Burgeson (left) with Donald A. Schmitter, lecturer of hospitality and tourism, in one of Caudell Hall's new demonstration kitchens.